Short run kit, 71 injected parts, 14 clear parts, 12 resin parts,16 in white metal. 2 Décorations. 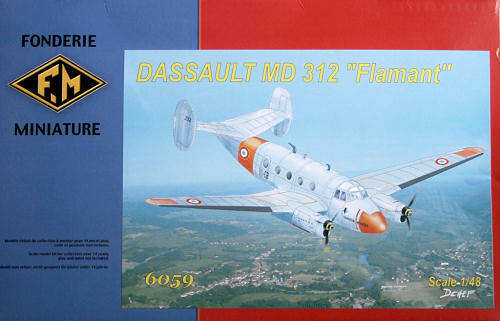 The Marcel Dassault MD312 twin engine light transport aircraft found its origin in the prototype of the Marcel Bloch (true name of Marcel Dassault ) MB.30 designed during the german occupation by the Société Bordeaux Aéronautique in Talence. Its unfortunate competitors was the SO94 and NC.701 Martinet to re-equip the French Air Force after the second world war. MD.312 for the light transport duties and flight school (No. 137 to 253), the glass-nosed MD.311 for training in bombing and navigation (No. 254 to 293), MD .312 M for the French Aeronavale (No. 294 to 318). Besides the fighter units which almost all received this aircraft for liaison and duties, the GE (Groupement Ecole) from Avord, the GLAM (Groupe de Liaison Aérienne Ministérielle ), the CIET (centre d'instruction des équipages de transport )and GAEL (groupe aérien de liaison et d'entraînement )were also equipped with this elegant French aircraft . The Navy was not forgotten with the six squadrons (1S, 2S, 3S, 10S, 11S and 54S) also equipped. Aside the pacific transport task well known, the aircraft had also been used in Algéria conflict in CAS with SS11 missiles on MD.311 or machine guns, bombs and rockets on MD.315. S. The last Flamant left active service in 1982. Four foreign countries used them; Cambodia, Cameroon, Madagascar and Tunisia. This kit is the latest by the FM, after the Mystere IVN . This important aircraft device in the French wing history had not been produced at this scale to date and we can applaud for this welcome product. This is the 312 model, devoted to school training as shown on the box art. This analysis is made from Technical documentation, excellent shots appeared in "Avord, the era of the Flamant" French book and in Air Magazine issue No. 38. I also have the chance to approach two in flight conditions Flamant not far from my home. The general forms are excellent and match the dimensions. 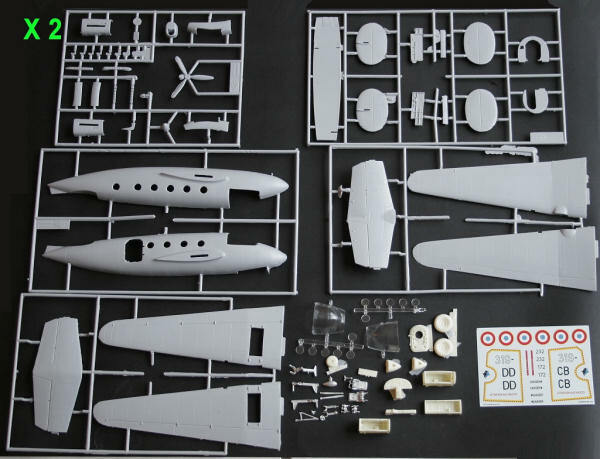 Even if the plastic surface is good, metal finish will require a light sanding and a primer for a flawless finish, this is also valid for the most common kits from mass production. This time the transparent parts are injected and the maximum clear appearance will be achieved by rubbing a compound paste followed by a varnish on the inside of the glass. FM has cleverly anticipated the cockpit adjustment , leaving a good margin at the front and rear of the item. This way it will be totally invisible. The cockpit interior consists of the instrument panel, consoles left and right in resin, while the steering wheel trim, the rudder pedals, the throttle, the joysticks, the pilot and the student ’s seats are in white metal (add blue harness with buckles from generic after market products). The internal structure on the wall sides is injected. All of this will unfortunately not very visible when the canopy will be closed, unless you open the upper hatches. For the central area, you’ll find the cockpit separation wall, the floor and rear bulkhead leading to toilets. If you open the beautiful resin access door you’ll make the two vertical ramps each side of it and you’ll also add the first aid as located on the left side. Before gluing the two half fuselage, don’t forget to put the front undercarriage bay in place and put a maximum weight to avoid a tail seater attitude. The wings respect the geometry according to the drawings (add a few additional access panels) and to get a proper fitment to the fuselage wing roots you’ll have to sand the wings from inside at this junction to reduce height. The resin main gear boxes should be enshrined in the lower half wings to fit easily into the engine nacelles. Sanding is also required with dry fitting to avoid putty. The three engines panels will be filled with their exhaust before gluing them to the wings. Even if the front intake is small, the first cylinders row of the Renault 12T engine would have been welcome. I tried with an Argus (FI 156, Me 108), they give perfectly illusion, but we do not see much finally. Gears legs are simple as in reality, add only the brake lines. The wheels are superb with the bolts in place. The tail has no specific comments; just sand them to get a fine trailing edge. Its proper position on the fuselage require the complete removal of the plastic surface on the fuselage where they were in contact, it’s the only solution to avoid a step on leading edge, and it took me only few seconds. Don’t forget to add a clear light on the cone tip. After painting you’ll add the antennas according to the notice (rather simple, I guess) and the gear doors and propellers. The decorations are for two natural metal aircrafts from the GE 319 bearing red-orange day-glo areas. The badge unit has been seen on left side, but from my collection I, at this date to seen them on right side. Inside the front doors don’t forget ATTENTION AUX HELICES markings, I really see them on the aircrafts. I'm always delighted by these second rank aircraft, especially French home made. If you follow the test remarks above you’ll not find deep difficulties. Le Fana de l'aviation n°186/187/188, AIR FAN n°19, 65,118 - Avord, l’ère du Flamant (Union de Publicité et d'Edition)- Air Magazine n° 38.